Preheat oven to 325 degrees F. Place four 4-ounce pots de creme pots, ramekins, or 6-ounce custard cups in a 2-quart square baking pan; set aside. In a medium bowl, lightly whisk egg yolks. Very gradually whisk the hot cream mixture into the egg yolks. Divide mixture among pots de creme pots. With baking pan sitting on oven rack, carefully pour enough hot water to the baking pan to come halfway up sides of pots de creme pots. Bake in a 325 degrees oven about 35 minutes or until edges of custards are set but centers jiggle slightly when shaken. Transfer pots de creme pots to wire racks; cool for 30 minutes. Cover and chill for 4 hours or up to 2 days before serving. Garnish In a small skillet combine honey and thinly sliced kumquat. Cook and stir over low heat until the honey melts and kumquats soften slightly and look glazed (about 3 minutes). Cool slightly, then spoon over pot de cremes before serving, using 2 or 3 kumquat slices for each pot. * Meyer lemons are less acidic than regular lemons, so they work well in desserts where you want a mild lemon flavor. If Meyer lemons are not available, substitute 3 tablespoons lemon juice and 1 tablespoon orange juice for the 1/4 cup Meyer lemon juice. Substitute regular lemon zest for the Meyer lemon zest. 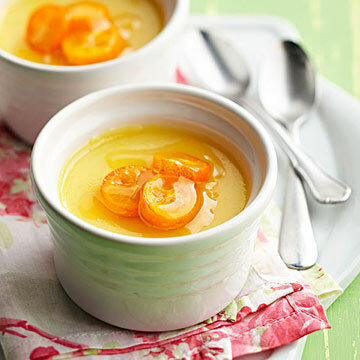 ** You can garnish the pots de creme with fresh raspberries rather than honey-glazed kumquats.